After a two-year stay in Mar's Victoria Crater, NASA'sOpportunity rover will be moving on to an even bigger playground. The rover has set its sights on a crater called Endeavour,more than 20 times larger than Victoria. To get there, Opportunity will have todrive approximately 7 miles (12 km) to the southeast, matching the totaldistance it has traveled since landing on Mars in January 2004. The rover climbedout of Victoria Crater earlier this month. "We may not get there, but it is scientifically theright direction to go anyway," said Steve Squyres of Cornell University,principal investigator for the science instruments on Opportunity and its robotictwin Spirit. "This crater is staggeringly large compared to anything we'veseen before." The Endeavour crater, a bowl 13.7 miles (22 km) across,should offer the chance to study a much deeper stack of rock layers than thoseOpportunity saw in Victoria Crater. "I would love to see that view from the rim,"Squyres said. "But even if we never get there, as we move southward weexpect to be getting to younger and younger layers of rock on the surface.Also, there are large craters to the south that we think are sources of cobblesthat we want to examine out on the plain. Some of the cobbles are samples oflayers deeper than Opportunity will ever see, and we expect to find morecobbles as we head toward the south." Just getting to the new crater itself will be a feat. Therover team estimated that even if Opportunity travels about 110 yards (about100 meters) each day, the journey could take two years. "This is a bolder, more aggressive objective than wehave had before," said John Callas, the project manager for both Marsrovers at NASA's Jet Propulsion Laboratory in Pasadena, Calif. "It'stremendously exciting. It's new science. It's the next great challenge forthese robotic explorers." Opportunity, like Spirit, is well past its expected lifetimeon Mars, and might not keep working long enough to reach the crater. However,two new resources not available during the 4-mile (6.4-km) drive toward VictoriaCrater in 2005 and 2006 are expected to aid in this new trek. One boon will be satellite images of the ground taken by theHigh Resolution Imaging Science Experiment (HiRISE) camera on NASA's MarsReconnaissance Orbiter, which arrived in Mars orbit in 2006. This tool cancapture details smaller than the rover itself. 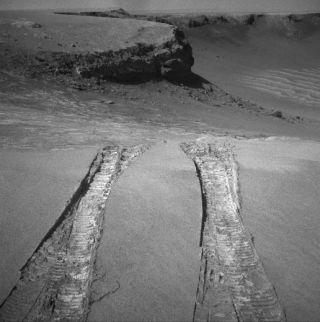 "HiRISE allows us to identify drive paths and potentialhazards on the scale of the rover along the route," Callas said. "This is a great example of how different parts of NASA's Mars ExplorationProgram reinforce each other." Other advantages come from a new version of flight softwareuplinked to Opportunity and Spirit in 2006, boosting their ability toautonomously choose routes and avoidhazards such as sand dunes. During its first year on Mars, Opportunity found geologicalevidence that the area where it landed had surface and underground water in thedistant past. The rover'sexplorations since have added information about how that environmentchanged over time. Finding rock layers above or below the layers alreadyexamined adds windows into later or earlier periods of time.